A ski field expansion project which also included access roads, lifts and village design (these sections followed more typical 12d Model processes than the areas described below). The requirements for balancing cut/fill volumes and drafting presentations on a ski trail are similar to a road design process. However, unlike roads, ski trails vary in width, x-fall and grade across and along the entire trail. 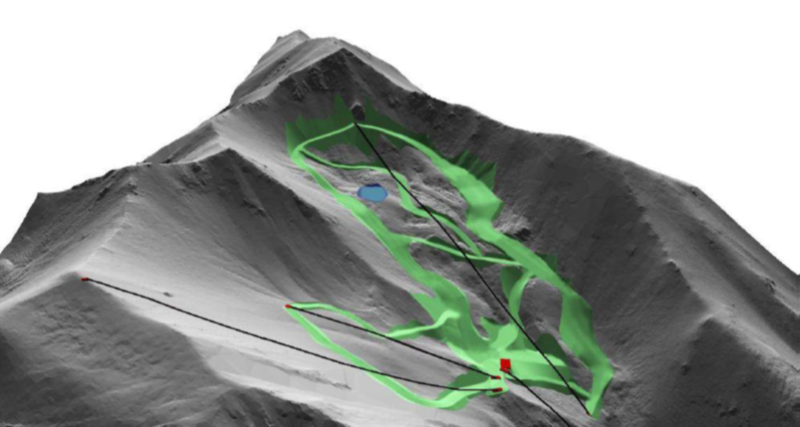 The team at Eliot Sinclair & Partners decided to use 12d Model software for this project because of its ability to quickly analyse DTM triangles by slope - a feature used to mark on the design the various ski trails, classified from beginner to advanced skier. Their existing 12d Model drafting processes were utilised to produce necessary plans to communicate the design to the client. They used Super Alignments and Apply Many templates functions to achieve desirable ski trails. Modifiers to TIN, Modifiers to String, and offset Modifiers in height were used to model ski trails in 2 metre strips along the length of the control alignment. Tin analysis - colouring triangles by slope - was used to confirm the critical slope criteria were met. The process was repeated until the cut/fill volumes balanced and trails achieved desired slope. Presentation plans were created, showing coloured contours by height, cut/fill and coloured triangles by slope as well as 3D perspective views. The use of 12d Model on this project assisted the team with meeting the specific design needs of this interesting endeavour - ‘thinking outside the box’ turned out to be the right choice.